The United Nations says Secretary-General Antonio Guterres is applauding the "truly historic summit" between the leaders of North Korea and South Korea. U.N. spokesman Stephane Dujarric said Friday that "many around the world were moved by the powerful imagery of the two leaders coming together to advance harmony and peace on the Korean Peninsula." He said the secretary-general "salutes the courage and leadership that resulted in the important commitments and agreed actions outlined in the Panmunjom Declaration for Peace, Prosperity and Unification of the Korean Peninsula." Dujarric said Guterres counts on the two Koreas to "swiftly implement" all the agreed actions "to further inter-Korean trust-building and reconciliation" and progress toward "sustainable peace and verifiable denuclearization on the Korean Peninsula." He said Guterres "looks forward to these gains being consolidated and advanced" at the upcoming U.S.-North Korea summit. Kim Jong Un has returned to North Korea after a summit with South Korean President Moon Jae-in in which they vowed to remove nuclear weapons from the Korean Peninsula but provided no specific new measures. As pop music blared, Kim and Moon firmly grasped each other's hands Friday during a lavish farewell ceremony at the border truce village of Panmunjom, as photos of their summit were projected onto a massive screen installed in front of the building where they met. Kim then boarded a black Mercedes Benz limousine that drove them back north. The summit was almost inconceivable just months ago after a year that saw them seemingly at the verge of war. NATO's chief is hailing the meeting between the leaders of the two Koreas but insists that international sanctions against North Korea should remain in place until it curbs its nuclear ambitions. Secretary General Jens Stoltenberg said Friday that the meeting between the two leaders "is a very important first step" that resulted from international pressure, notably economic sanctions. He told reporters at NATO headquarters in Brussels that "sanctions should remain in place until we see a real change." Stoltenberg underlined that "there is a long way to go before we see a full resolution to the crisis." South Korean conservative politicians criticized the joint statement issued by the leaders of the Koreas after their summit at a truce village, saying Seoul let Pyongyang off the hook by failing to secure a clear commitment to discarding its nuclear weapons. Liberty Korea Party Chairman Hong Joon-pyo took to Facebook on Friday to denounce the summit as a "show camouflaged as peace" and said it was as if Moon "wrote down the words Kim called out." Party spokeswoman Jun Hee-kyung criticized Moon for agreeing to a statement calling for the denuclearization of the Korean Peninsula instead of the North's nuclear disarmament. North Korea for decades has vowed to pursue nuclear development unless Washington removes its troops from the peninsula and the nuclear umbrella protecting South Korea and Japan. Moon's liberal Minjoo Party called the statement a "historic triumph" that can help set up successful talks between Kim and U.S. President Donald Trump on the nuclear issue. Japan's leader is welcoming the outcome of the inter-Korean summit as a step toward resolving the North Korean threat. 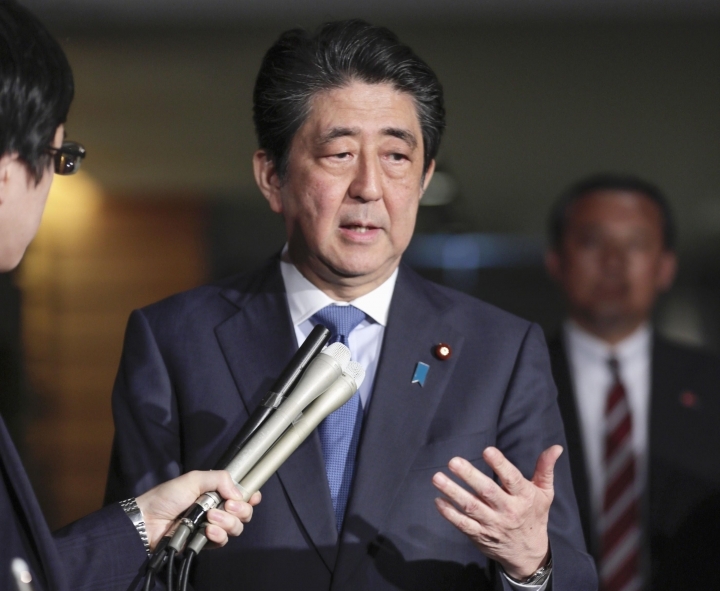 Prime Minister Shinzo Abe praised the talks Friday as a "forward-looking move." He told reporters in Tokyo that he expects North Korea to take concrete actions toward denuclearization through its planned talks with the U.S.
North Korean leader Kim Jong Un is expected to meet President Donald Trump in late May or June. Kim and South Korean President Moon Jae-in met in the border village of Panmunjom. They pledged in a joint statement to rid their peninsula of nuclear weapons, but didn't identify any specific new measures to achieve that. Abe says he hopes to get further details and Moon's evaluation of the talks when they talk by phone. North and South Korea have agreed to stop all hostile acts over "land, sea and air" that can cause military tensions and clashes, after a summit between their leaders at a border truce village. North Korean leader Kim Jong Un and South Korean President Moon Jae-in announced Friday that starting May 1 they will suspend all loudspeaker propaganda broadcasts the countries have been blaring at each other across their heavily-armed border. They will also dismantle broadcasting equipment. The Koreas also agreed to stop flying propaganda leaflets across their border. The countries also agreed to take steps to defuse the relatively frequent clashes around their western maritime border by designating the area as a "peace zone" and guarantee safe operations of fishermen from both countries. The Koreas plan to hold military talks in May to further discuss reducing tensions. The two Koreas have agreed for South Korea's President Moon Jae-in to visit Pyongyang sometime this autumn. The agreement came after a historic summit between the leaders of the two Koreas at the border village of Panmunjom on Friday. A joint statement didn't say when Moon would visit Pyongyang. But it says Moon and North Korean leader Kim Jong Un will meet on a regular basis and exchange calls via a recently established hotline. North and South Korea have agreed to open a permanent communication office in the North Korean town of Kaesong and resume temporary reunions between relatives separated by the 1950-53 Korean War following a historic summit between their leaders. North Korean leader Kim Jong Un and South Korean President Moon Jae-in also said after their summit on Friday that the Koreas will seek to expand civilian exchanges and pursue joint sports and cultural events. The family reunions are expected to take place around Aug. 15, an anniversary for both Koreas celebrating their peninsula's liberation from Japanese colonial rule after the end of World War II. Koreas plan to hold high-level talks and other negotiations to fulfill the agreements made at the summit. North and South Korea say they will jointly push for talks with the United State and also potentially China to officially end the 1950-53 Korean War, which stopped in an armistice and left the Koreas still technically at war. North Korean leader Kim Jong Un and South Korean President Moon Jae-in announced after their summit on Friday that the Koreas will push for three-way talks including Washington or four-way talks that also include Beijing on converting the armistice into a peace treaty and establishing permanent peace on the Korean Peninsula. The Koreas said they hope the parties will be able to declare an official end to the war by the end of this year. While President Donald Trump has given his "blessing" for the Koreas to discuss an end to the war, there can be no real solution without the involvement of Washington and other parties that fought in the war because South Korea wasn't a direct signatory to the armistice that stopped the fighting. The two Koreas have agreed to rid their peninsula of nuclear weapons but failed to provide any new specific measures how to achieve that. A joint statement issued after their leaders' talks Friday says the two Koreas confirmed their goal of achieving "a nuclear-free Korean Peninsula through complete denuclearization." North Korea has placed its nukes up for negotiations. It has previously used the term "denuclearization" to say it can disarm only when the United States withdraws its 28,500 troops in South Korea. The statement didn't say what other specific disarmament steps North Korea would take. North Korean leader Kim Jong Un and South Korean President Moon Jae-in are walking back to a building at a border truce village to resume their summit after talking privately for around 30 minutes at a nearby bridge. Kim and Moon, after their afternoon session, are expected to jointly announce the outcome of their meeting. The statement is expected to be announced in about an hour. China has welcomed the summit between its ally North Korea and South Korea, saying it applauds the countries' leaders for taking a "historic step" toward peace. Foreign Ministry spokeswoman Hua Chunying told reporters at a briefing Friday that Beijing wishes that the meeting between the North's leader Kim Jong Un and South Korean President Moon Jae-in will achieve a "positive result." Hua quoted the famed Chinese writer Lu Xun: "After all of the suffering, the brotherly friendship still exists; with a smile, let's forget about the debt of gratitude and revenge." Hua says China looks forward to taking this summit as an opportunity to expand into a "new journey of long-term peace and stability on the peninsula." North Korean leader Kim Jong Un and South Korean President Moon Jae-in are talking privately for more than 20 minutes, sitting on chairs at a blue bridge inside a border truce village where Moon is hosting Kim for a summit. The leaders on Friday walked unaccompanied to the bridge for a private conversation before they are expected to resume the afternoon session of the summit. It isn't immediately clear what is being said between the leaders. South Korea's presidential office said earlier Moon expressed satisfaction after the first round of talks with Kim at the border truce village of Panmunjom. The office says the leaders discussed the denuclearization of the Korean Peninsula and that working level officials from both countries are working on a joint statement. North Korean leader Kim Jong Un and South Korean President Moon Jae-in have poured a mixture of soil and water from both countries onto a pine tree they planted at a truce village as a symbol of peace before resuming their highly anticipated summit. Kim and Moon have also unveiled a stone plaque placed next to the tree that was engraved with a message saying "Peace and Prosperity Are Planted." The pine tree dates to 1953, the year the Korean War ended in an armistice. The soil and water were brought from the Koreas' mountains and rivers. The leaders then talked while walking unaccompanied on a nearby bridge before they are expected to resume the afternoon session of their summit at Panmunjom. Kim at one point was seen waving away photographers as he and Moon continued their talks sitting on chairs placed at the bridge. A Japanese Cabinet official says his government and the families of Japanese citizens abducted by North Korea in the 1980s and 1990s are closely watching the inter-Korean summit in hopes the two leaders discuss the issue. North Korean leader Kim Jong Un and South Korean President Moon Jae-in are meeting Friday in the border village of Panmunjom. Katsunobu Kato, Japan's minister for the abduction issue, says he hopes progress will be made at an upcoming summit that Kim is expected to hold with President Donald Trump. Tokyo has asked Seoul and Washington to press Kim to resolve the decades-old problem. Pyongyang has acknowledged abducting 13 Japanese decades ago. Five of them returned to Japan in 2002. Pyongyang says the eight others have died, but Japan believes they could be alive. British Foreign Secretary Boris Johnson is welcoming the summit between the two Koreas but says he doesn't expect any great breakthrough that might curb North Korea's nuclear ambitions. Johnson told reporters at NATO headquarters Friday, "I am very encouraged by what's happening." He says: "I don't think that anybody looking at the history of North Korea's plans to develop a nuclear weapon would want to be over-optimistic at this point. But it is clearly good news that the two leaders are meeting. Absolutely." North Korean leader Kim Jong Un and South Korean President Moon Jae-in are expected to jointly announce the outcome of their summit in a few hours. South Korea's presidential office said earlier Friday Moon expressed satisfaction after the first round of talks with Kim at the border truce village of Panmunjom. The office says the leaders discussed the denuclearization of the Korean Peninsula and that working level officials from both countries are working on a joint statement. The leaders will resume their meetings in the afternoon after planting a memorial tree. Moon's office says he and Kim are expected to announce the results of their meeting before attending a dinner banquet scheduled for 6:30 p.m. Moon's office says the banquet will be also attended by the wives of Kim and Moon. Also invited to the dinner are famous cultural figures from both countries, including the North's Hyon Song Wol, the leader of Kim's hand-picked Moranbong girl band, and South Korean pop star Cho Yong-pil. Seoul says North Korean leader Kim Jong Un's wife will cross the border into South Korea to attend a dinner banquet after the Koreas' summit talks at a border village. Kim crossed the border into South Korea on Friday morning for talks with South Korean President Moon Jae-in at the southern side of Panmunjom. Kim was accompanied by a group of top officials but his wife, Ri Sol Ju, was not present. Moon's spokesman Yoon Young-chan says that Ri will cross the border and attend the banquet with Kim, Moon and Moon's wife Kim Jung-sook later Friday. Ri is a former singer with the North's Unhasu Orchestra. Seoul says the leaders of the two Koreas had "sincere, candid" talks on the denuclearization of the Korean Peninsula" and other issues during their summit talks. South Korean President Moon Jae-in and North Korean leader Kim Jong Un are holding the Koreas' third-ever summit talks at the border village of Panmunjom on Friday. 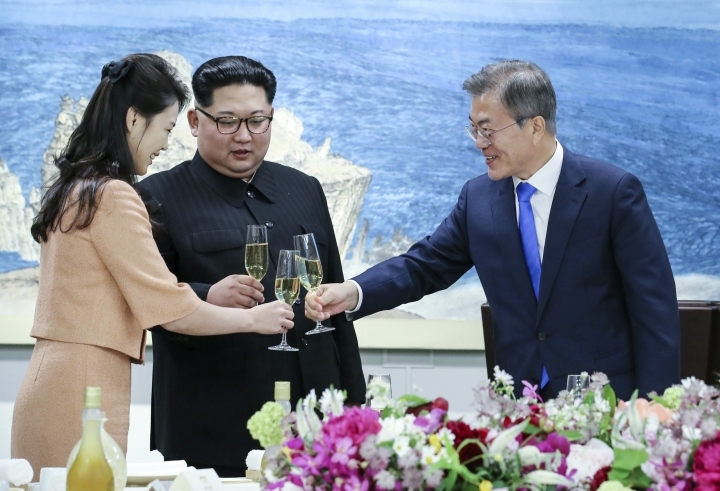 Moon's spokesman Yoon Young-chan told reporters that the two leaders also discussed how to establish peace on the Korean Peninsula and improve ties between the rivals. They are to meet again later Friday. Yoon says the two Koreas are working on a joint statement to be issued after their one-day meeting. North Koreans are reacting to news their leader is holding a summit with South Korean President Moon Jae-in with cautious expressions of support. Though South Koreans and much of the world were able to watch some of the key summit events live, the only news available from North Korea's state media well into the afternoon on Friday was a brief dispatch that leader Kim Jong Un had departed the capital to meet Moon inside the Demilitarized Zone that divides their nations. State television was expected to report on the summit later in the day. In the meantime, residents of the capital kept their comments short. Pyongyang resident Jin Kum Il, referring to the ruling party's daily newspaper, says: "I saw the news today in the Worker's Daily about our respected supreme leader Kim Jong Un setting off to go to the North-South summit on the south side." He adds: "This meeting is coming after more than 10 years and I hope it's successful." Another resident Kim Song Hui is noting Kim has made it clear this year he intends to repair ties with Seoul. She told an AP Television News crew: "Our respected Supreme Leader Kim Jong Un already in his New Year's address this year stressed the importance of improving relations between North and South." South Korean conservative activists have set fire to North Korean flags during a rally against the summit talks between the leaders of the two Koreas. Hundreds of activists gathered near the border village of Panmunjom on Friday to protest the talks between North Korean leader Kim Jong Un and South Korean President Moon Jae-in. They set on fire two paper North Korean flags with the images of Kim and his late father and grandfather. They also chanted slogans including "Step down, Moon Jae-in!" No major violence has been reported. South Korea says North Korean leader Kim Jong Un described the country's transport conditions as poor as he and South Korean President Moon Jae-in discussed Moon's potential visit to the North. Moon' spokesman Yoon Young-chan says Kim's comments came after Moon expressed a desire to travel across North Korea to visit Mount Paektu that touches the country's border with China. According to Yoon, Kim in response said such a trip might be currently uncomfortable for Moon because the country's transport system was deficient. Yoon says Kim also said North Korean delegates who visited the South during February's Winter Olympics also came back impressed with South Korea's bullet train service. Yoon says Moon in response said North Koreans would also be able to enjoy the South's high-speed trains if the rivals improve relations and reconnect their rail networks across the border. North Korean roads are often bumpy and poorly maintained. Kim earlier this month met with China's ambassador and visited a hospital where Chinese tourists were being treated after a deadly bus crash killed 32 in North Korea. South Korea says North Korean leader Kim Jong Un made a reference to North Koreans who escaped from the country while discussing prospects of peace between the rivals in his summit with South Korean President Moon Jae-in. Moon's spokesman Yoon Young-chan says Kim mentioned the defectors among people who have high expectations for the summit to heal scars and improve relations between the rivals. Yoon quoted Kim as saying: "We should value this opportunity so that the scars between the South and North could be healed." Yoon says Kim added: "The border line isn't that high; it will eventually be erased if a lot of people pass over it." North Korea normally expresses anger toward defectors and often accuses South Korea of abducting or enticing its citizens to defect. The North in 2016 accused the South of abducting 12 North Korean women who had worked at restaurant in China and demanded them to be sent back to the North. That was months before the North called a senior North Korean diplomat who defected to the South as "human scum." Around 30,000 North Koreans have defected to South Korea since the end of the 1950-53 Korean War. North Korean leader Kim Jong Un made a reference to a South Korean island targeted by a North Korean artillery attack that killed four in 2010. South Korean President Moon Jae-in's senior spokesman said Kim said the residents of Yeonpyeong Island who have been living under the fear of North Korean artillery attacks and also families separated by the 1950-53 Korean War have high hopes for the inter-Korean talks to help heal past scars. Moon called for more meetings between the leaders and said he wishes to travel in North Korea to visit Mount Paektu near the country's border with China. 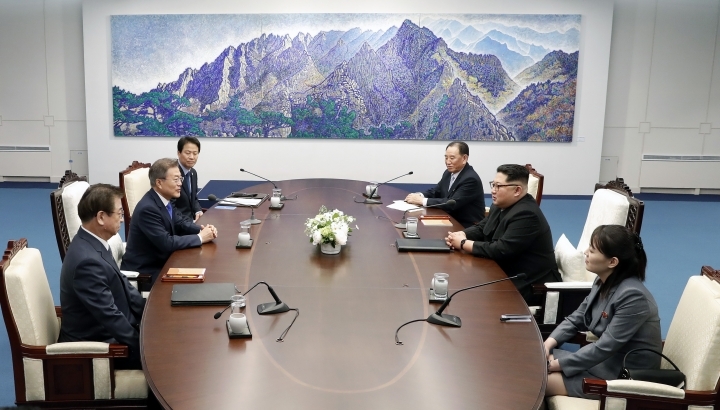 Kim said the trip under current conditions would be uncomfortable, but the North would improve its transportation networks should Moon decided to visit. Kim also said the North Korean delegation during their visit to the Pyeongchang Winter Olympics in February came back impressed by the South's bullet train services. Moon in response said the people of both Koreas would be able to enjoy high-speed train services if relations improve and the countries connect their rail networks across borders. North Korean leader Kim Jong Un and South Korean President Moon Jae-in have finished the morning session of their summit at a border truce village. Television showed bodyguards jogging beside Kim's black limousine as it rolled back to the northern side of the Panmunjom where Kim and other North Korean officials participating in the summit are expected to have lunch. The leaders plan to meet again in the afternoon at the southern side of the village for talks Seoul says are aimed at resolving the standoff over the North's nuclear weapons. North Korean leader Kim Jong Un has thanked South Korean President Moon Jae-in for greeting him at a "historic place" ahead of their meeting at the border truce village of Panmunjom. At the historic moment when the two leaders shook hands across the Military Demarcation line that bisects the rivals, Kim said that his heart "keeps throbbing." Moon replied to Kim's thanks by saying that the North Korean leader made a "very courageous decision" to come to the South. The closed-door talks are ongoing. North Korean leader Kim Jong Un has given his younger sister a place at the negotiating table for the first North-South Korea summit in more than a decade. Kim Yo Jong has emerged as the most visible member of Kim Jong Un's regime after her brother — since she became the first member of the ruling North Korean family to travel to the South in early February for the Olympics. She was in Kim's delegation as he walked across the line that divides the two Koreas on Friday morning and took a seat beside him as he started his first round of talks with South Korean President Moon Jae-in. The only other North Korean official present was former intelligence chief Kim Yong Chol, the top official in charge of relations with the South. North Korean leader Kim Jong Un says he's ready for "heartfelt, sincere and honest" talks with South Korean President Moon Jae-in on pending issues and that the Koreas must not repeat the past where they were "unable to fulfill our agreements." Kim did not make any direct mention of the North Korean nuclear issue in the part of his talks with Moon that were shown on live television. Kim also joked that he hoped Moon would enjoy North Korea's famous cold noodles that will be brought to the banquet after the summit, saying it was difficult to bring the noodles from capital Pyongyang. He then turned to his sister sitting to his left and said "maybe I shouldn't have said (Pyongyang) was far." Moon in response there were high expectations surrounding the inter-Korean summit and that they produce an agreement that would please the people of Koreas and also "every peace-loving person in the world." North Korean leader Kim Jong Un has signed a guestbook with a message wishing for peace between the Koreas as he arrived for a summit with South Korean President Moon Jae-in. Kim wrote in the guestbook: "New history starts from now, at the historic starting point of an era of peace." Kim earlier stepped into the southern side of a border truce village of Panmunjom to become the first North Korean leader to set foot into the South since the 1950-53 Korean War. The meeting between Kim and Moon is only the third-ever summit between the rivals who remain technically at war. Seoul says the meeting will be focused on discussing ways for North Korea's nuclear disarmament and establishing a permanent peace regime in the Korean Peninsula. The White House says it is hopeful the summit between the two Korean leaders will achieve progress toward peace. North Korean leader Kim Jong Un crossed over to the southern side of the world's most heavily armed border Friday morning to meet South Korean President Moon Jae-in. They shook hands and inspected an honor guard before later holding a closed-door discussion about Kim's nuclear weapons. The White House said in a statement that it is "hopeful that talks will achieve progress toward a future of peace and prosperity for the entire Korean Peninsula. ... (and) looks forward to continuing robust discussions in preparation for the planned meeting between President Donald J. Trump and Kim Jong Un in the coming weeks." North Korean leader Kim Jong Un has made history by crossing over to the southern side of the world's most heavily armed border to meet rival South Korean President Moon Jae-in. It's the first time a member of the Kim dynasty has set foot on southern soil since the end of the Korean War in 1953 and the latest bid to settle the world's last Cold War standoff. The overwhelming focus of the summit, the country's third-ever, will be on North Korea's growing arsenal of nuclear weapons. Kim's news agency said earlier Friday that the leader would "open-heartedly" discuss with Moon "all the issues arising in improving inter-Korean relations." South Korean President Moon Jae-in has left Seoul's presidential palace for a high-stakes summit with North Korean leader Kim Jong Un that will kick off a new round of nuclear negotiations with Pyongyang. Moon on Friday briefly stepped out of his black limousine and cheerfully shook hands with hundreds of supporters who waved white South Korean flags and raised banners with messages including "Please Achieve Successful Denuclearization." Hundreds of members of the Korean Veterans Association arrived on buses from different parts of the nation hours earlier to send off Moon's motorcade. 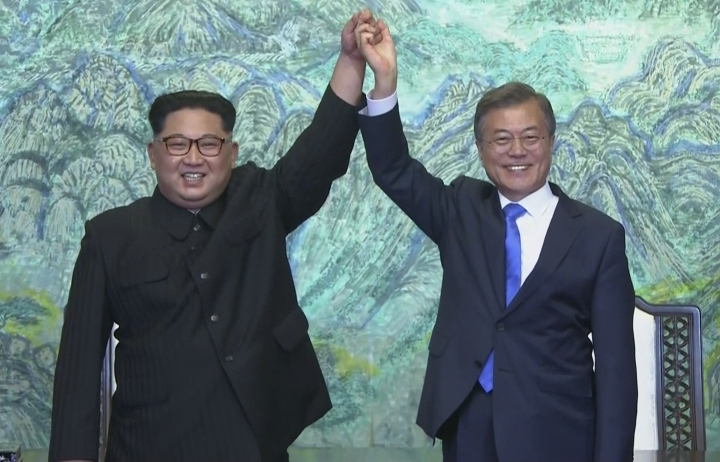 The meeting between Moon and Kim is just the third summit between the rivals since the 1950-53 Korean War. North Korea's state media reports that leader Kim Jong Un has left Pyongyang for the North-South summit meeting with South Korean President Moon Jae-in. A report by the North's Korean Central News Agency said Kim would "open-heartedly" discuss with Moon "all the issues arising in improving inter-Korean relations and achieving peace, prosperity and reunification of the Korean peninsula." The report called the summit on Friday "historic" and noted that it would be held on the south side of the Demilitarized Zone, a first for Kim. It also said that after the talks Kim will plant a memorial tree with Moon, make public the results of the talks and attend a dinner hosted by Moon before returning to Pyongyang. Enter Hollywood, the central informative hub of the world’s prime entertainment capital. We provide only the latest, juiciest and hottest news about your favorite celebrities 24/7. Copyright © 2015 - 2019 Enter Hollywood. All Rights Reserved.